Whites in Washington, DC, live, on average, twelve years longer than African Americans in the same city. In the 2007–9 Great Recession, college graduates faced an un- and underemployment rate of 1 in 10; the rate for high school dropouts was greater than 1 in 3. These startling facts are just some of the issues covered in The Measure of America 2010-2011. With a foreword by Jeffrey D. Sachs, the second volume in The Measure of America series is an easy-to-understand guide to where different groups stand today, and why. The book contains American Human Development Index ranking for all 50 states, 435 congressional districts, major metropolitan areas, racial and ethnic groups, as well as men and women. It concludes with a set of recommendations for priority actions required to improve scores on the Index across the board and to close the stark gaps that separate groups. 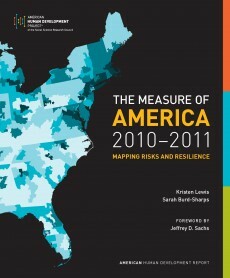 The Measure of America 2010-2011 also shines a spotlight on risks to progress and opportunity, and identifies tested approaches to fostering resilience among different groups: Who is most at risk for obesity? How can workers secure better footholds in the job market? How important is early childhood education? This report provides the tools necessary to build upon past policy successes, protect the progress made over the last half century from emerging risks, and develop an infrastructure of opportunity that can serve a new generation of Americans.